The day before crews were still working intensively to make everything right. Not all was done in time, which was clearly visible during the game. Some skyboxes closed, internal wall cladding only 25% installed – that's hard to miss. But the sole fact that Ghelamco Arena was ready to hold a game may still be treated as a success if one takes a look at photos from early spring. And even more so when one realises that the project dates back to 2003 and only got under construction in late 2011. Fans have been kept waiting a long time. Long enough to see stands almost sold out yesterday, when KAA Gent defeated VfB Stuttgart 2:0. Even if only a friendly and played on grass laid just two days before, this result still goes into history. Apart from the game yesterday also saw a music and light show, parts of which can be found in video clips under this text. 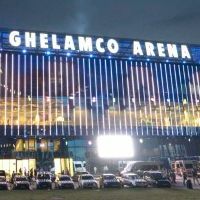 Meanwhile Ghelamco, naming rights owner and contractor at the same time, have 2 weeks to have all elements set until regular season starts for KAA Gent, who will play their first 2013/14 tie on August 4. The stadium is now 97% ready, according to the investor.